Hatshepsut sī kong-goân-chêng 15 sè-kí sî Ai-ki̍p ê cha-bó͘ hoat-ló, chêng 1473 nî kàu 1458 nî kî-kan chāi-ūi. Kathleen Kuiper, pian. (2010). 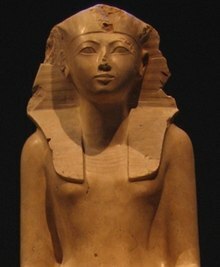 "Hatshepsut". Britannica Guide to the World's Most Influential People : 100 Most Influential Women of All Time. Encyclopaedia Britannica, Inc.
Chit ia̍h siāng bóe tī 2018-nî 6-goe̍h 30-ji̍t (Pài-la̍k), 09:45 ū pian-chi̍p--koè.